Neymar had to be restrained by Paris Saint-Germain staff as he attempted to gain access to the match officials' room, according to reports in France. French radio station RMC has claimed that the Brazilian was so enraged that he tried to reach the referee as PSG players and officials struggled to come to terms with a gut-wrenching late defeat to Manchester United. Slovenian referee Damir Skomina gave a penalty to United in stoppage time after VAR had shown the ball hitting Presnel Kimpembe's arm from a Diogo Dalot shot. Neymar was stood on the touchline at this point, presumably having descended from his executive box just in time to celebrate with his teammates. 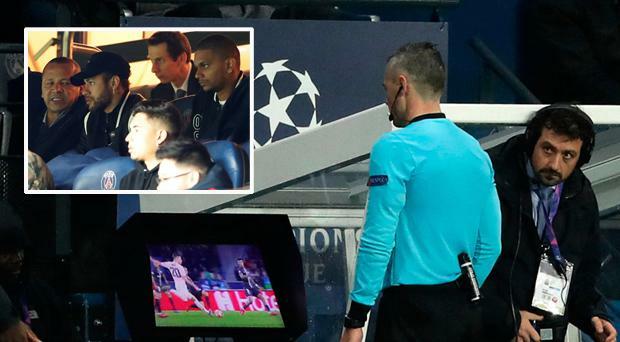 The television cameras perfectly captured the Brazilian's disbelief as he stood by the tunnel watching on as PSG's Champions League dream fell apart. It was after the final whistle, RMC claims, that he would then try to reach the officials and be held back by club staffers. "Neymar ended up in the corridor trying to get to the referees office before being restrained by members of PSG staff," the report says. That same report claims that club president Nasser al-Khelaifi took his anger out on a door at the Parc des Princes. Neymar grabbed headlines post-match with a wild diatribe on Instagram , fiercely criticising the decision to award a penalty and claiming the ball had hit Kimpembe's back. "This is a disgrace, they put four people that know nothing about football in charge of looking at the replay for VAR," he said. "There is no penalty. How can it be a handball when it hits his back?! Go f**k yourselves!" PSG boss Thomas Tuchel defended Neymar after his outburst was read to the German in the post-match press conference. "Of course it's a strong reaction, he was at the field. "Sometimes after a big fight you use words and reaction emotionally that you take back some hours later. He wanted to come back with us in the quarter-finals and he's been biting his nails at every game we've played, so don't be too hard with him. I wouldn't over-interpret the use of his words. In the heat of the moment, it's quickly typed into a smart phone."